News | O. W. G.
What have the O.W.G. been up to? Read our posts to find out. On the 2nd of February 2019, the Oldbury Writing Group, or OWG for short, journeyed into the far reaches of Wolverhampton. It’s not often we travel beyond our borders, but a certain place was calling for us. It was the Wolverhampton Literature Festival. Upon our arrival, we gathered our bearings. It’s nice to know the interior of the Wolverhampton Art Gallery hasn’t changed much since our last visit. Of course, we had a few events lined up, starting with the Real Life Stories, hosted by Louise Palfreyman. Never thought I would stand up and read something in the Black Country dialect, but hey, you live and learn. As for Nicole, she conquered the nerves and showed her quality upon the stage. In return, she received a rapturous applause. There were many other readers, all providing a significant moment in their lives. It’s quite fascinating to hear such vivid stories from different periods of time. With the event reaching its conclusion, the group made their exit, pleased beyond the meaning of words. A special thank you goes to Louise for offering us the chance to express ourselves, every minute of it was worthwhile. The afternoon was still in its infancy, and we needed something else to keep us occupied. So what does the group do? We seek out opportunities, hoping to learn more. Thankfully, we stumbled upon an event regarding literary agents, hosted by two accomplished authors, Anna Stephens and G X Todd. They explained the do’s and don’ts of approaching literary agents. It was informative, and we gained inside knowledge. At the end of the session, we asked questions and received the appropriate answers. We even nabbed ourselves a sneaky photo of them. With the day getting on, I believed it was time for me to take my leave and return home. I have learned a lot from this trip, more so than I initially expected. I forgot to mention how great Nicole and Tania are with their photography. Top-notch stuff! With trips like these, it’s important to make memories and share them with one another. As for the other members, they took a short trip to a rather fancy-looking cafe. It was Victorian in design. I do remember Heather telling me about a life writing session with the one and only Louise Palfreyman. It ran for two hours, but the experience was worth it. It gave her the ability to see writing in a more reflective manner. Now, the best part is yet to come, even though I wasn’t there to witness it. Angela, our chief-in-command, stayed behind until the sky went pitch black. There was something else, an event that is synonymous with real life, and a topic of great interest and debate. It was titled ‘Poets Against Racism’, co-hosted by other poets of ethnic backgrounds. No matter who you are, we are all human beings, and as equals, we should be treated as such. I do believe this is a message it was trying to portray, and what better way to do it than through the power of words. Speaking of words, I have babbled on long enough, so allow me to wrap up this eventful day out with a nice pink ribbon. Don’t worry, WolvesLitFest 2020, we aim to come back, with a bang! It only seems like five minutes since we met a very talented Italian writer by the name of Valerie for the first time, but that was twelve months ago at our very first meeting of 2018. Since then, we have welcomed more members, Mike, Kwane and Syisha too. It is always a pleasure to meet new people, learn about their writing style and try to help as much as we can in ways of being constructive, inspiring and encouraging. In January, the OWG put together a talk and a performance of poetry and short stories for the second ever Wolverhampton Literature Festival. We met members from the Telford Writing Group and a lady by the name of Louise Pelfrey from the Arts Foundry at Wolverhampton University. Meeting both were very interesting and constructive as Louise is putting together an anthology of life stories and photographs to be read out at the Wolverhampton Literature festival in February 2019. I know that a few members of the OWG have taken part in this anthology and it will be a pleasure to watch when the time comes. 2018 has been a year of firsts too. As with all writers, it is important to get to know the world around you and take inspiration from it, so therefore many of our group outings this year has been to nature reserves, such as Sandwell Valley, Leasowes Park and Kinver Edge. All three were extremely beautiful places where history has a place and where legends live. For example, Leasowes Park has the legend of the Lady Pool. When I first heard of the Lady Pool and its ghost, I was so inspired, I wrote a poem about it called ‘The Lady Pool’. I submitted it to the Black Country Bugle, and it was published the 2nd April 2015. This is just one example of how such places can inspire us. Kinver Edge has an intriguing and historical past. The rock houses were once inhabited by the people who lived there, and they are exactly what it sounds like, they are houses carved out of the sandstone. Kinver is not just a nature reserve where people can enjoy the clean air and wildlife. It also has a pretty little town, a place where antiques can be sought, or if you prefer, a pub that sells some of the best pork pies in town. Or an orchard where the imagination could grow as wild as the apple trees. Sandwell Valley is well known for all local residents to be a source of peace, play and if you so wish to walk and take in the sights of the wildlife. I know that one of our members, Heather was so inspired by Leasowes Park that she has painted a canal, covered in yellow Iris’s as was such a sight that we came upon during our walk. Anyone of those nature reserves could be a fantastic setting for a story, and the genres and ideas could be limitless. We have tried new foods too, such as plantain and Sharon fruit. We ate a banana and an apple and really took notice of our five senses and learnt not to take for granted everything that we eat, but to savour the moment and use this information in our writing. So, my advice would be that the next time you eat, really take notice and enjoy what you are eating or drinking. As if you ever have a starving character, your food will taste the best in the world for him or her. On Saturday 28th April, the OWG went to the Birmingham Museum and Art Gallery. It was a lovely day out, all the artwork on display and the large statue of Lucifer as we walked into the round room. Also fascinating was the Egyptian artefacts they had on display and the other artefacts from different ancient cultures from around the globe. It was a day out that we will remember for many more moons to come. Then on the 14th of July, the OWG celebrated Black Country Day at the Old Hill Festival. It was here that our Daniel got lost and we spent much of our time waiting for him, eventually, Julian found him, and we enjoyed the market stalls, the church stalls and the live music. Nicole bought a giant unicorn balloon. It was a hot day, and the cold drinks were going down a storm. One of the stalls on the market sold pens and all sorts of fancy stuff. Could I walk away from a pen store? Nope, not on your Nelly, so I walked away with a lovely little pen with an ‘A’ carved into the clip. In August, we celebrated both my fortieth birthday and the fourth anniversary of the OWG. You can imagine my surprise when the group presented me with a £45 gift voucher for WH Smith. Oh, that was such a lovely present. The first opportunity I got, I went to WH Smiths in Merry Hill and spent the lot. I could not wait to get home and revel in my gifts, and it was more poignant because I was looking forward to starting my third year in studying for my Combined BA Hons. Degree in English Literature and Creative Writing with the Open University. Bally, bless her heart, took me out for a meal, and then we had drinks at her place. Also, Jackie bought me a bag, a diary and a pen in the shape of a flamingo. It was a lovely day, and the OWG made it extra special just because they were there. There is nothing like being able to spend your birthday with friends, and I get to spend every Saturday morning with them. How cool is that? Our fourth anniversary was another very special day. Bally brought a cake and Nicole took plenty of photos. We enjoyed one another’s company and wished for many more years together as a group. Now, I have not got to tell you how amazing Nicole is at baking, everyone in the OWG has tried her cakes and cookies and every now and again she surprises us with something new that she has made. To name but a few, cinnamon rolls, peanut butter and jam traybake, and most recently gingerbread star biscuits. Oh, they were lovely, everyone tucks in, and there is hardly anything left by the time we finish our group meeting or outing. She is a very talented lady both on the page and in the kitchen. Another thing the OWG was involved in was judging a poetry competition for the year 5 children of Heath Fields Primary School. This was not an easy thing to do as all of the poems deserved to win, but we could only choose four winners. Each winner had a first, second, third and fourth certificate and everyone else who took part had a certificate of participation as we did not want anyone to feel that their effort had gone unnoticed. Hopefully, this competition and others like it around the world will inspire our next generation of poets. On the 8th December, some of the members of the OWG, including myself, went to the Steelhouse Lane Lock-Up in Birmingham. That was another fun day out. We spoke to people who had worked there when it was in use, and we spoke to a female PCSO. She had been doing her job for seventeen years and my, she could tell a story or two. We walked around the lock-up, cautiously as the floor didn’t feel safe underfoot due to the fact that it was cast iron with holes so wide you could see down to the other floors below. The cells were small but fascinating as there were mug shots of old Victorian prisoners. We had our fingerprints taken, and we took many photos. At the end of our tour, we all crammed into an interview room and pretended to be criminals being interviewed — it was a lot of fun. Then just before we left, we bought our usual collection of pens, bookmarks and (I bought a cup) postcards to say that we had a great day and we wanted to take a memento home to remind us of the fun we had. Our final outing for the year was our Christmas meal at the Court of Requests in Oldbury. We had our Christmas party at the library and our meal at the pub. It was lovely, twelve of us packed around a long table, decorated with crackers and Christmas themed table settings. Both Niv and I had a bad cold at the time, but it was a lovely day, and I wouldn’t have changed it for the world (except for the cold of course). So much has happened over the past twelve months that makes it practically impossible to write all of it in just one article, but you will see in our news pages that there are write-ups of the year’s events. The last thing I would like to tell you is the poetry evenings that I run once a month at the Britannia Inn, Rowley Village. A fellow writer, Maddie Williams and I started these evenings to bring a bit of poetry to the Rowley Regis area. Every month they have become more and more popular, and they are a favourite for the OWG. It is a place where we can all relax with a beer or a soft drink and enjoy an evening of poetry. 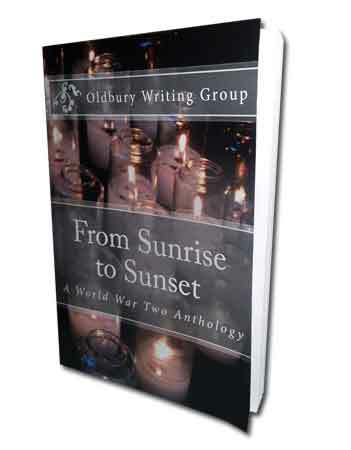 The OWG has spent much of our writing time putting together our second anthology, which is to be published in the New Year. This is a book of poems and short stories inspired by the assignment set each week. Each assignment is an imagination prompt that each member has had a go at writing over the past four years. The book was named by Dave Edwards as Naked Words and Empty Cages, and the artwork for the front cover was designed by one of the group’s artists, Heather Barrett. I can’t wait to see the finished book, and we will let you know both on this website and our social media pages the date, time, and place of the book launch, and any other relevant information regarding our forthcoming anthology. Now, I would like to say thank you so much to everyone who has come along to the meetings on a Saturday morning, shared our outings with us and contributed your stories, your life experiences and your friendship. But a special thank you goes out to Nicole, for without whom, the OWG would not be what it is today. It does not matter how advanced you are with your writing, it makes no difference on as to why you write, and there is no right or wrong genre either. In fact, there is no right or wrong way in which to write. Your writing is as unique as you are. The fact is that you write, and my message is simply to never give up. Never let anyone tell you that writing is wrong, that you are wasting your time. Never let people tell you to stop what you are doing, never let them tell you are never going to get anywhere and that you are not good enough. Ignore snide remarks, laughter and above all never let them get you down. You are a writer because you write, what you write is irrelevant, and if you ever need help, encouragement, reassurance, inspiration, constructive criticism, then that is why the OWG is here. I formed the group because I had to suffer all of those indignities while I was writing my first novel. I knew there would be more people out there just like me who needed support. I never gave up, and I wouldn’t want you to either. You are better than you know. All you may need is a little bit of support and guidance, and you will find that here, with us at the OWG. God bless you all and best wishes for a successful and prosperous new year. On Saturday 22nd December 2018, we celebrated our fifth Christmas together by having a small Christmas party in the library and a Christmas meal at the Court of Requests in Oldbury. During our Christmas party in the library, we drank some mulled wine (alcoholic and non-alcoholic), ate gingerbread biscuits (I baked them), mince pies and chocolates. We also exchanged cards and gifts. We then read out our Christmas inspired stories and poems, and Dave read out the well-known Christmas poem ‘Twas the Night Before Christmas’, which Angela had brought to the meeting. Like with any other meeting, we also had interesting conversations about Christmas, writing and life in general. After our meeting, we all headed over to the Court of Requests for our Christmas meal. A table decorated with a festive purple tablecloth and cute red and white crackers was prepared for us at the back of the pub. We all took a seat and looked through the menus. Some of us were traditional and ordered meals from the Christmas menu. I had the Christmas veggie burger meal, and others had the stuffed turkey meal. Others were a little rebellious and ordered from the normal menu instead, not wanting to stick to tradition. However, we all individually enjoyed our meals. While waiting for our meals, we pulled crackers and read out our jokes. Some wore the cracker hats, and others rebelled against wearing them. Well, that was until it was photo taking time, and I, as always, insisted on everyone wearing their hats. Once our main meals were eaten, we continued reading our Christmas stories and poems. We then chatted away about everything and anything, simply enjoying each other’s company. Only three of us had dessert: me, Heather and Sandra — the others had to go home. Heather and Sandra had the apple crumble, and I had the Melt Mallow Stack. My dessert was delicious, and it is something I plan to recreate. We all had a wonderful time, and it was the perfect way to end 2018. Our Christmas parties and meals have always made Christmas even more special for me. I’m happy and lucky to be part of such an amazing group, and I hope we have many more Christmases together. We hope you had a lovely Christmas, and we would like to wish you a Happy New Year. On Saturday 25th August 2018, as part of the continuing OWG 4th anniversary celebrations, Angela, Nicole and I visited Kinver Edge and the Rock Houses. On this occasion, there were just the three of us, but we still had a really nice day. For anyone that may not know, Kinver is a beautiful village, west of Stourbridge and north of Kidderminster, perhaps best known for its rock houses. Well, after a bit of a disjointed journey, courtesy of my trusty sat nav, we arrived at our destination, and set off, eager to scale the dizzying heights of Kinver Edge. (Incidentally, I myself hadn’t been to Kinver for six years, and I had forgotten that parking for Kinver Edge is free. Another bonus). We’d opted to follow the woodland trail, as this was apparently the shortest and least strenuous. Hmm, I think this was a case of famous last words. That said, it wasn’t too bad, though the trail was quite steep in places, so it might not suit those with mobility issues. Our route was well marked and led us along some nice, shady paths and as one would expect, through plenty of greenery. Like Sandwell Valley, plenty of conservation work has been/is being done, and it was nice to see that here too — the off-trail areas had been allowed to go wild. At one point, a series of basic hides had been put together with fallen branches, so presumably, that was a good spot for wildlife. I myself didn’t see any, but who knows how many pairs of beady eyes were watching us from the dense undergrowth. Soon enough, we reached the top and marvelled at the view. You can see for miles, in almost every direction. For those who like to know which way home lies, a compass type beacon has been provided for your convenience. As one would expect, most local towns were pointed out, as well as a few places that are a bit further away. Even New York was featured, though I think that is a bit too far for a Saturday hike. After a short break for lunch, we followed a gentle path up to the famous rock houses, and for the first time in my life, I was able to go inside. As a boy, I visited Kinver several times with my Grandfather and had seen the rock houses when people were still living in them. I suppose I thought that inside they were the same as any other house. I was very wrong. It was like a trip back in time. The rock houses, or cave houses, were cut into sandstone, which was formed roughly 250 million years ago when the entire region was a desert, a desert which presumably encompassed nearby Bridgnorth, which is hard to imagine, given the green and pleasant landscape of today. The houses (currently owned and maintained by the National Trust) were known to be occupied as early as the 1700’s and were described by one of the earliest visitors as being very clean and comfortable, and having modern conveniences. But of course, back then, little basics like electricity and flushing toilets didn’t exist. Yet despite that, these cave houses had plenty in their favour. For one thing, having no gas, electricity or running water meant no bills. Also, they were cosy; being solidly enclosed made them warmer in the winter and cooler in the summer. The typical form of heating was a cast iron range, which doubled as a cooker, and given the location, they had no shortage of firewood. The houses typically have one general living area and one bedroom, both spacious. Looking around, you can see little niches or alcoves cut into the walls, which were probably for candles. I don’t suppose for one minute that it would suit everyone, but I would happily live there. If you haven’t been, it’s worth seeing. After our visit to the rock houses, we headed into Kinver for a look round. As I mentioned earlier, it’s a lovely place, but there isn’t that much to see. We did, however, find a great little antique shop, hidden away in a side alley – the proprietor of which was a retired firefighter from Rowley Regis. It really is a small world. Angela treated herself to a few books, including a copy of the complete works of Edgar Allen Poe, dating to the 1800’s, and we all got to see a small collection of blades, including a Scottish basket hilt Claymore, though unfortunately, it was a replica. Still a beautiful piece, though. We concluded our little ramble with a visit to a local pub, the Plough and Harrow, just on the High Street. We were all very good and had soft drinks (honest guv), and Angela sampled one of the speciality pork pies. I hadn’t been in that pub since 1988, and while it had changed a bit, it still managed to keep its traditional appeal. As usual, there were a few comical moments that are worthy of a mention, but since they all focus on one certain group member, I will not name names. Things got off to an encouraging start when a certain someone mentioned that they could identify any of the snakes we might encounter, including the adder, which apart from being venomous, it has a very distinctive pattern. A little later, following our visit to the rock houses, this same someone went on a scrumping spree through a nearby orchard, swiping at least two apples, supposedly to see if they will grow when planted in a garden. So, there you have it, another adventure crossed off the list. And since we’ve still got a little bit of summer left, there is plenty of time for another. All suggestions welcome. It is amazing that four years after the birth of the Oldbury Writing Group (OWG), we are still going strong, but none of what has happened would have if it were not for the brilliant members that we have. We have seen it all since day one, a teacher that wanted no more than to expand his imagination, a nurse who loves to write poetry, an Italian children’s author, a life writer, graphic novelists, journalists, content and copywriters and of course people who just want to write for the fun of it. Being a writer, or indeed any kind of artist is no good if you are just in it for the money, you have to love what you do in order to do it right. The reader can tell whether or not there is passion in the words that have been written, and that is the one thing that every member who comes to the OWG have in common. Whether we write for fun, therapy or as a profession, we all love what we do, and that passion is shown every week in the stories, poems and other works that are shared. It has been this way for four years now, and I am so proud that I am the founder and leader of this magnificent group. We are not just group members; we are friends that get together every week. Sometimes we see each other more often: we visit each other, call and text one another. We help each other out, and the one thing that you can always rely on is honesty. We can trust each other to tell the truth about each other’s works. We want to know if our works are good enough to be published and we will tell the truth as it would be better coming from a friend you can trust rather than an unscrupulous editor that won’t bother to spare your feelings. The Oldbury Writing Group encourages equality and diversity. It is great to see two people standing together; two people who could not be more culturally different, but they have their love of the written word in common. One of the trips we went on a couple of years ago was to Haden Hill House in Cradley Heath, which is a big manor house with beautiful grounds and a lot of history. I took a photo of two of our members who have since moved on, of a white, English, elderly gentleman and a young, black male from Africa’s Ivory Coast. They were not just standing side by side, but they were leaning on one another – friends because of their common interest. I love how the OWG has brought people together, created friendships and helped to increase the confidence and self-esteem of people who have really needed a lift in life. We have shared our good times, like my 40th birthday when I invited all of the OWG to my birthday party and they put together and bought me a £45 voucher for WHSmiths (which I have now spent), and we have shared our griefs. All the members of the OWG are my friends, and I care about them all deeply. We have learnt so much, not just from each other, but from the outings that we have taken together. Another place that we have regularly visited as a group was the PowWow Festival of Writing in Moseley. About three years ago, there was a talk about the pros and cons of getting a Master’s Degree in Creative Writing. The two talking was a Master’s Degree student and a university professor on the subject. The student said, in so many words, that you would do just as good if you joined a good writing group to study creative writing instead of studying it at a university. I do believe that, but an element of my degree is in creative writing, so who am I to say. Having said that, I do run a good writing group, but the truth is, this group would not be the group it is if it were not for Nicole J. Simms. Nicole is the group’s deputy leader, and she runs the online side of the group. She knows exactly when to take charge and when to step back; she has all the makings of a natural leader, and she has done the OWG proud. She is a wonderful human being and one of my closest friends. We would be lost without her. We gain inspiration from one another too, listening to each other’s woes and praises, life experiences and general chit-chat. One thing is for sure, it is impossible to put into words just how much the OWG means to me. Not just the trips, inspirational talks, the stories and poems that we hear from each other, not the new skills or even the fact that we have each helped one another to overcome our insecurities or improve our self-esteem, or the fact that we are all such good friends. It is all of that and more. I hope that in the next four years, the OWG would have expanded to gain new members who become good friends, I hope we publish more and more books together as we already have done with From Sunrise to Sunset and another anthology that we have coming out towards the end of this year. I hope that we see more personal publications from each member, and I hope that we are all still there to help support each other through our personal and passionate journeys to expressing ourselves through the beauty of the written word. On Saturday 28th June, four daring members of the OWG, namely Angela, Dave, Julian (me) and Nicole, undertook a scouting mission into Sandwell Valley, encompassing the Priory ruins, the Swan Pool, and concluding with the RSPB reserve. And a great day it was, too. One of the first things that struck me was the rich greenery. The walkways are well maintained, but to a greater extent, the surrounding woodland has been allowed to revert to its natural state. Tall leafy trees line the main trail, but off track, patches of dense, thorny undergrowth help to ensure that people are kept away from the valley’s delicate wildlife; just as it should be. A short way along the trail, our collective eye was drawn to a metalwork sculpture of a clump of flowers. It was nothing fancy, but novel, despite the graffiti, so delicately sprayed on the dull grey leaves. Further on, we found what I think is a small stream (Google maps doesn’t say), roughly five feet wide and quite literally carpeted with Jade green algae. The water’s canopy was so still and perfect, it looked like a road, leading off into the distance. Here and there, decaying logs and fallen branches raised their heads above the surface, rather like hungry crocodiles in a scene, more reminiscent of an Australian swamp than a tiny stretch of water in the West Midlands. Next, we reached the ruins of Sandwell Priory, and wandered round, trying to guess which foundation was which (little realising that just a few feet away, was a site map). I found myself trying to mentally reconstruct the site, wondering if the original builders had used mortar, etc. The excavation work had been carried out by volunteers, between 1982 and 1988. They certainly did a good job. Back on the trail, we soon reached the Park Lane waypoint and continued towards the Swan Pool. The last time I was there (obviously a very long time ago) the trail leading to the pool didn’t exist. I think there was a simple stile on the main path, allowing hikers access to the field. These days, thick green bushes, trees and shrubs line the path, effectively hiding the pylons, which once dominated the view. It was here that Angela spotted a pair of Damsel Flies, such fragile little things, a beautiful shade of blue. At first, I was surprised to see them. It was quite open at that point, and the wind was strong. But of course, with the land having been allowed to go a little wild, there was plenty of shelter for them. We skirted the inner edge of the Swan Pool. There were a few Canadian geese here and there, and perhaps one or two other species, but for the most part, the waterfowl were concentrated on the opposite side. So, after a quick stop for lunch, we headed for the RSPB reserve. I knew that Forge Mill Lake was popular with ornithologists, but I had no idea there was a dedicated RSPB site there. Just in case you’re thinking of going (which I would recommend), parking is £3, and the drinks are quite pricey, but the site itself is free entry. Not being a bird watcher myself, I was pleasantly surprised. The visitor centre is really nice, and inside is an observation deck, with a great view of the pool; perfect for anyone with mobility issues. We followed the track and found that once again, the surrounding landscape (while well maintained) was quite wild. Rarely have I seen so much dense greenery in one place. Much better for wildlife and it stops people straying too close to the water. Soon, we came to a hide. Again, I was impressed because it was deceptively large. Inside, seating was basic, but the view was fantastic. Ok, it was only a pool in Sandwell, but that’s hardly the point. I was surprised to find that the RSPB had provided a telescope and some binoculars for people to use. Most of the enthusiasts had their own of course, but I found them handy. Luckily, Angela was very clued up on the different species and quickly spotted a couple of lapwings (apparently rare) and a moorhen. I heard one of the enthusiasts saying that he’d been watching a heron, though I didn’t see it myself. I’m not sure I will ever be a “twitcher”, but it was lovely to see the birds, just doing what they do, unthreatened and unafraid. We left the hide after about fifteen minutes and carried on around the lake and back to the visitor centre. It was a lovely walk, but there wasn’t a great deal more to see. As usual, one of the best things about the group outings is spending a little time with kindred intellects and simply enjoying the day. There were, of course, a couple of comical moments. Inevitably, at one point, it started raining. Dave, Nicole and myself, were suitably covered up, but our Angela hadn’t brought a coat or umbrella. Never fear; I sorted her out with a German army poncho, in a very fetching olive green. Not everyone could get away with it, but she carried it off nicely. It wasn’t long before the rain got heavier and I was forced to put my poncho on too. Naturally, Nicole snapped a few discreet photos (I’m negotiating with her for the negatives). So, that’s another mission completed. I’m not sure if it will inspire any great literary works, but time will tell. While I think about it, Angela suggested that we should have a special name for our touring group. So, I applied my keen mind to the task for a few minutes and came up with “OWG Reconnaissance and Expeditionary Squad.” I quite like it, but my son reckons its closest acronym would be “Ogres.” I welcome any thoughts on the matter.